Wooburn Singers was founded by Richard Hickox in 1967 to help raise funds for repairs to Wooburn parish church where Richard’s father was the vicar. The choir sang at the inaugural concert of the Wooburn Festival which still continues as a vibrant annual event. Richard’s career quickly went from strength to strength; he founded the City of London Sinfonia in 1971 and was Associate Guest Conductor of the London Symphony Orchestra, Conductor Emeritus of the Northern Sinfonia, and co-founder of Collegium Musicum 90. Because of these connections, Wooburn Singers was often privileged to perform with international soloists as well as other major choirs. Richard conducted the Wooburn Singers until the end of 1985, when the pressure of his expanding international career became too great. He accepted the position of President and remained in close touch with the choir until his untimely death in 2008. His musical legacy continues through his nearly 300 recordings, including the Britten operas with the City of London Sinfonia and numerous recordings with the London Symphony Orchestra and BBC National Orchestra of Wales. In 1986 Richard was succeeded as Music Director by Stephen Jackson, who combined the appointment with that of Director of the BBC Symphony Chorus. During this time the choir collaborated in several BBC concerts, including Proms in the Royal Albert Hall, and also began biennial foreign tours, visiting Venice, Paris and Prague. Jeremy Backhouse became Musical Director in 1998, directing a number of major works and themed concerts, and leading the choir on successful tours to Tuscany, Geneva and Barcelona. Greg Beardsell took over as Music Director in April 2005, and consolidated the choir’s reputation as the premier chamber choir in the South Bucks area, giving memorable performances of major works of the choral repertoire including Handel’s Messiah and Bach’s St John Passion, as well as eclectic concerts of a capella repertoire ranging from the 14th to the 21st centuries (often in the same concert!). 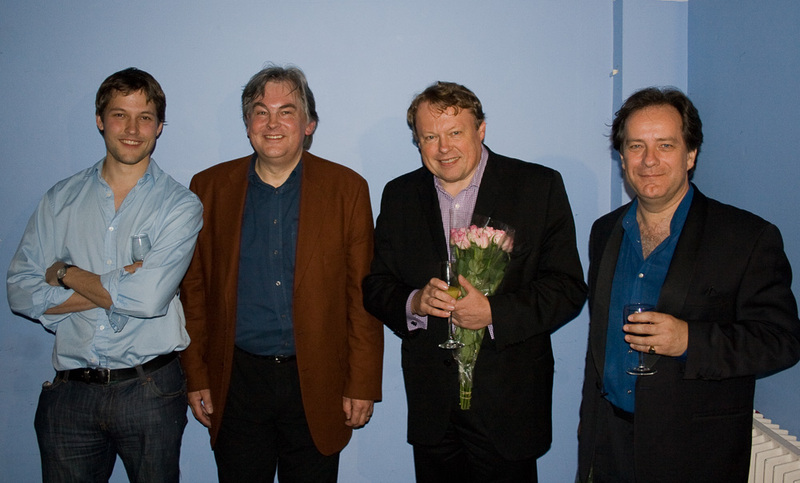 In May 2007 the choir celebrated its 40th anniversary with a gala concert reflecting some of the works introduced to the choir by each of the four Music Directors, and followed by a reception at which all four were present, as well as many former members of the choir. We were devastated to hear of the sudden death of Richard Hickox at the end of 2008 and gave a concert in his memory in March 2009 at which his mother Jean (a founder member of the choir) was guest of honour. Greg Beardsell stood down as Music Director in the summer of 2013, giving his last concerts with the choir on the tour in St Petersburg; at his farewell UK concert in St Lawrence’s Church, West Wycombe, the choir gave the first performance of Three prayers, with a vision of light, commissioned from contemporary composer Gabriel Jackson to mark Greg’s time with the choir. 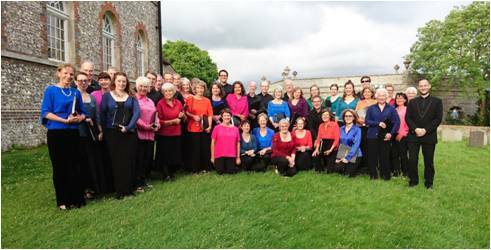 In September 2013, Wooburn Singers welcomed their new Music Director, Tom Hammond-Davies, who has directed many exciting concerts including Dvorak Stabat Mater, Rachmaninov Vespers and a very successful evening of Bruckner motets with Onyx Brass. In collaboration with the baroque players from the Oxford Bach Soloists, we have performed Bach’s St John Passion in 2014, Magnificat in 2016 and Mass in B Minor in 2018. The St Matthew Passion is planned for 2020. Summer concerts have focused on lighter music, Shakespeare in Jazz, Cinema Classics and most recently an evening of Gershwin and Tippett, with a second performance at the Brandenburg Choral Festival in London. Wooburn Singers have continued their tradition of Come & Sing Days. In addition to the normal programme of four to five concerts each season in our home area of South Bucks, the Come & Sing Days are scheduled twice a year, open to all choral singers, giving the opportunity to experience larger choral pieces in workshop conditions. Repertoire has ranged from Brahms Requiem or Elgar Dream of Gerontius to rarely performed works such as Rachmaninov The Bells or George Dyson Nebuchadnezzar. These days end with a run-through performance to friends and family. Recently, for Karl Jenkins The Armed Man, we were joined at the run-through by several players from the Slough Philharmonic orchestra. Wooburn Singers is also in demand for other concerts and functions: in October 2010 the group was invited by Lady Howe, the High Sheriff of Buckinghamshire, to sing at her Shrieval Service; the group also sings annually at a local charity event for the NSPCC at Hedsor House and braves the cold to sing carols at Beaconsfield Station for Ian Rennie Hospice. Smaller groups also sing for weddings and other events. Wooburn Singers also continue their tradition of touring Europe in alternate summers and have visited Krakow, Segovia, Malta, Tallinn, St Petersburg and Bavaria. The choir visited Langres (twinned with Beaconsfield) in eastern France in July 2017. Wooburn Singers is proud to have celebrated its golden anniversary in 2017 with a gala concert involving previous conductors and singers. 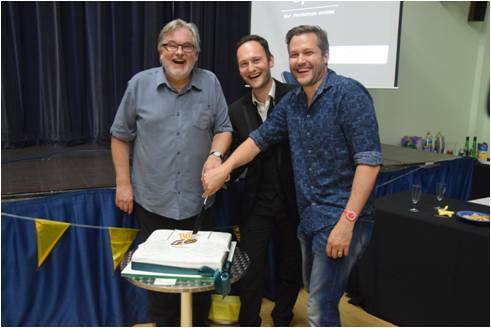 Past & present Music Directors at the 50th anniversary party in June 2017. Left To right: Stephen Jackson, Tom Hammond-Davies and Greg Beardsell.